Project NEON is Windows 10’s upcoming design language which will arrive with Windows 10 Redstone 3 scheduled for later next year. Project NEON has been in the works for over a year internally at Microsoft. Earlier this year lots of information about Project NEON surfaced and not to mention yesterday’s incident. At the Windows Developer Day event company accidentally showed off Project NEON officially for the first time yesterday. And now another full concept image also surfaced online which really looks phenomenal. Actually it’s the same image which showed off at the event. But now a high-quality screenshot of the Project NEON concept has been leaked on Twitter today. The new image gives a much clean look at the teaser of Project NEON. As you can see the image shows off the Groove Music app in Windows 10 with some of the design components from Project NEON, including the new Acrylics, as well as the improved taskbar design. Project NEON heavily relies on animations, blur, and consistency. 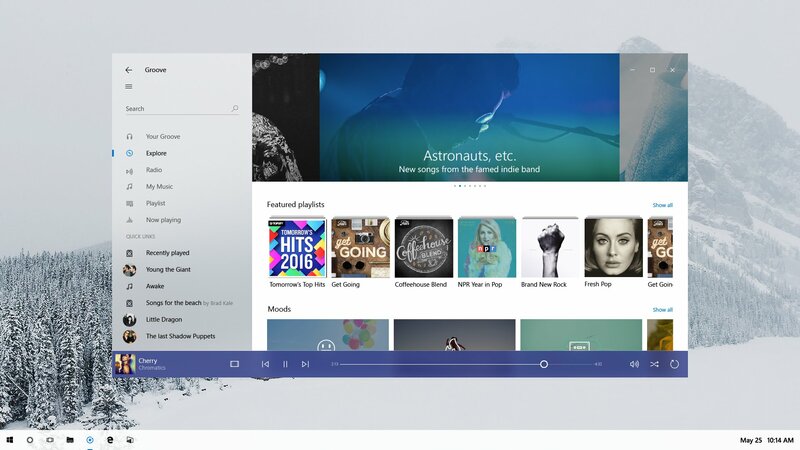 With NEON, Microsoft is introducing a new component called “Acrylic” to the Windows 10 design, which is essentially some blur in the background, sidebar or the navigation of the app. Project NEON builds upon the design language introduced with Windows 10, with its simple and clean interfaces, but adds some much-needed flair to the UI that the current design language just lacks. Did you like the the Project NEON? or wanna stick withe current UI? Let us know in a comment below. this is want microsoft fans are waiting for, and much needed for mobile attraction.